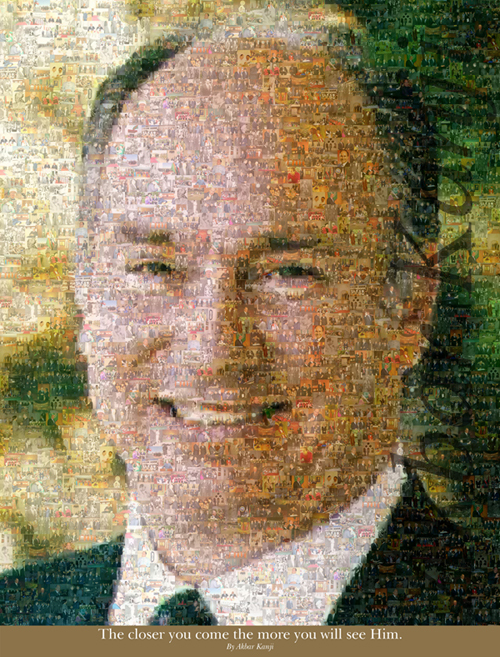 A pixel sample of the portrait of His Highness the Aga Khan shown above. View the pixel strip further from the screen to see the facial features and move closer to the screen to see more of his dedications. The portrait is made up of 1500 'digital mosaic' pieces. Copyright. Akbar Kanji. Akbar’s magnificent contribution is a work of labour and love, and Simerg is delighted that he is sharing this special portrait with readers of this Web site to mark the auspicious and happy occasion of Navroz, the Persian New Year. We convey Navroz Mubarak to all our readers, and wish everyone happiness and success in all walks of life. The previous post, below, has two new poems and ginan explanation related to Navroz. The digital portrait is Copyright, Akbar Kanji. Hi-resolution print in varying sizes (recommended is 36″ x 24″ or 48″ x 36″) which will include the artist’s original signature is available for purchase from the artist. Please write to him at: akbarkanji@hotmail.com. About the artist: Born in Bangladesh, Akbar Kanji moved to Pakistan where he pursued his childhood dream of becoming an artist by completing a Graphics Design Diploma at the Karachi School of Art. He continued his interest at other Fine Art, Performing Art and Visual Art institutes in Karachi and Toronto, and also trained under well known Pakistani artists including the late Ismaili artist Gulgee, Rabia Zubairi, Talat Hussein and others. He has served the Ismaili community’s Arts and Culture portfolio, and currently resides in Toronto where he works as a graphic designer. Comments can be viewed/submitted by clicking on the comments link at top of this page. For links to articles posted on this Web site since its launch in March 2009, please click What’s New. Sign-up for blog subscription at top right of this page. This work of art by artist Akbar Kanji is amazing! Excellent work, congratulatios for this fantastic work. GOD BLESS YOU. Wonderful artistic work. A unique attempt, simply superb. Great and innovative work. Best wishes and Ya Ali Madad. Amazing…this is a remarkable achievement! What a fantastic job you have done on this auspicious occasion of Navroz. May Mawla always keep in good health and may he bless you and your family with lots of Baraka and may all your good wishes are accepted. Great artistic work. Keep it up. Congratulations my great brother. Remarkable achievement. Well done! Simply Brilliant. Keep it up and Navroz Mubarak!!! Great picture. Virtually a feast for the eyes and heart! Keep up the great work. May Mawla bless you always. Amen. Excellent work! I have never seen anything like this before.Very intricate. Bravo!! Fantastic Work. Navroz Mubarak to you and your family. Keep up the good work. An amazing work, nice. Navroz Mubarak to all. Your reputation for excellent work precedes you! Beautiful work. Thanks for sharing and Navroz Mubarak! Beautiful work. Navroz Mubarak to all Ismailis around the world. Great artistic work. Appreciate your ability to bring life to the work. Navroz Mubarak to you and all Ismaili brotherhood and sisterhood. Amazing! Thanks for sharing, this is a perfect way to start Navroz morning! Ya Ali Madad and Navroz Mubarak. The title says it all. A terrific idea put into practice. Thank goodness for creativity and freedom of responsible action. Thank you for sharing once again! Novroz Mubarak to you and your family members as well, you did a good job, great work. The photograph of Mowlabapa is beautiful. Is it possible to buy it? Please let me know. What a lovely day to receive it and feel his noor through his eyes. Navroz Mubarak to you and May Mowla fill your and your families life with spiritual and material barakat. To purchase a high resolution print of the photograph, please write directly to the artist at akbarkanji@hotmail.com. Thanks for sharing and Navroz Mubarak to you.